Bohemian Turkish Kilim Rug - 2'7'' x 3'10'' Featuring a vintage Bohemian look, this wool kilim is one of a kind and woven in Turkey. 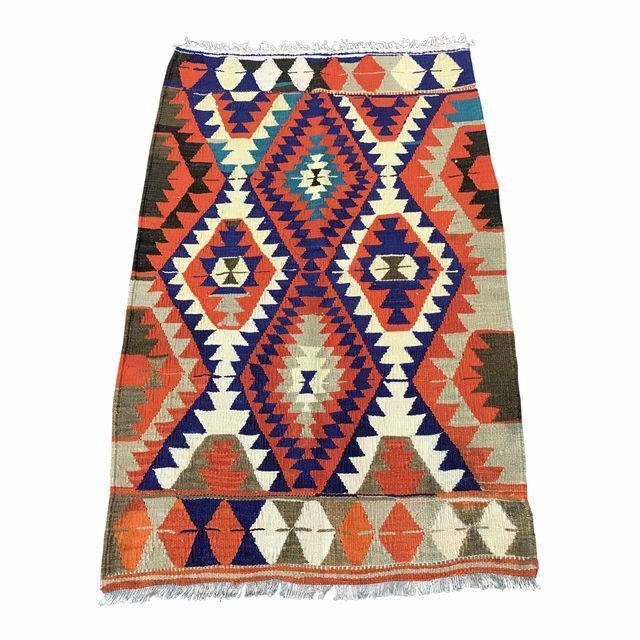 The Boho Vintage Turkish Kilim is wool, flat-weave rug which updates any room's decor with an eye-catching tribal pattern. Much more than ordinary floor coverings, this kilim rug presented itself as a dowry of a bride. This unique vintage kilim is truly one of a kind, and is approximately 50 years old. Adding to the uniqueness of this piece is the top-notch quality and condition it exhibits, this timeless classic has been in storage..